Travel to India to feel the cool, blue waters of the Bay of Bengal stretch for miles along the East Coast of India – unbroken except by the sound of waves nudging each other. The waters of the Bay of Bengal silently meet the Indian Ocean somewhere between Ceylon and Myanmar (formerly Burma). Out of the sapphire expanse rise islands with sands the colour of the purest gold. Seemingly virgin country, swaying palm trees and forests dot these golden beaches. Where the sands are not forged of gold, the beaches are stretches of pure white, with sky-blue waters lapping their shores. This is Andaman and Nicobar, a group of 300 islands, of which only 50 are inhabited. Paradise, some might say, but not so about a century ago. For Port Blair, the capital of the Andaman s, is where the British built one of the most dreaded penitentiaries in all of India. The Andaman and Nicobar islands are inhabited by native aboriginals like the Onges, the Shompens, the Sentinelese, the Andaman ese, the Jarawas and the Nicobarese. Their numbers are fast dwindling, with the Sentinelese in particular numbering a little over a hundred. However, they are still fighting shy of the outside world and every effort by ‘outsiders’ to colonise them is met with fierce resistance. Similarly, the Jarawas have constantly resisted all contact with the modern world – happy with their ‘sequestered existence’. The Sentinelese and the Onges tribes paint their naked bodies. Some of them hunt pigs, fish and turtles with harpoons made of metal. Most of the tribes are agriculturists with only a few thousand of them surviving today. Tourists are discouraged to interact with these tribals and the areas in which they live are cordoned off, to ensure nothing untoward occurs. 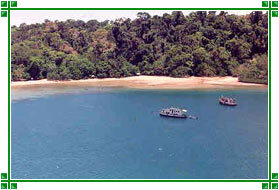 Tropical rain forests cover the Andaman and Nicobar islands in a dense, green shroud. The archipelago houses more than 3,000 species of plants and fruit. The region is susceptible to flash storms, which makes fishing difficult during the monsoons when high velocity winds sweep the islands. The temperature does not fluctuate too much – it hovers between 20oC-32oC round the year. To travel these magnificent Andaman Islands some formalities are required as these islands are not very easily accessible. For instance, foreign svisitors require a ‘Restricted Area Permit’ that is valid for 30 days. Permits can be obtained from Indian embassies abroad or from Calcutta, Chennai and Port Blair. Initially, a 15-day permit is issued, which can be extended for another 15 days. The permit allows foreigners to stay in South Andaman , Little Andaman , Bharatnag,, North Passage, Neil, Havelock and Long Islands. Foreign tourists are barred from visiting the Nicobar islands. On arrival, they need to report their presence to the Deputy Commissioner of Police, and while departing, their permits are stamped.